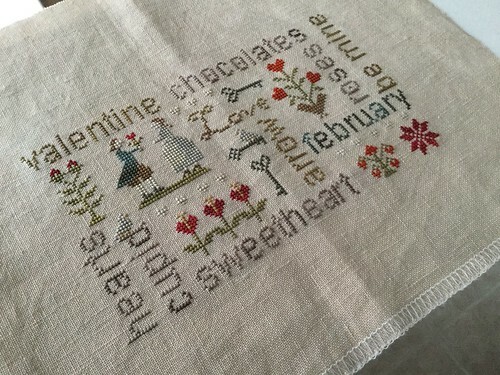 February Word Play by With Thy Needle & Thread - 40 ct. Vintage Pecan Butter by Lakeside Linens and GAST (1 over 2). 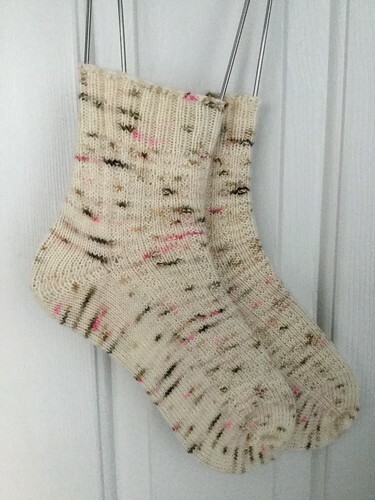 Blueberry Waffle Socks by Sandi Turner - Hedgehog Fibres Sock "Teacup" using Size 2.25 mm Nova Platina 32" circular needles. American Sampler by Plum Street Samplers - 40 ct. Vintage Meadow Rue using CC, GAST and WDW (1 over 2). Citron Shawl by Hillary Smith Callis - Malabrigo Lace "Fuchsia." Size US 6 needles. Dutch Beauty, Cross Stitch Nation, Chalk Squared Sept. and Oct., Summer at Hollyberry Farm, 40 ct. Doubloon and 40 ct. Vintage Fawn. Hey Nicole! Heartstring Samplery has some wonderful charts...I stitched "Always in My Heart" last year, but have 5 more in my stash begging to be stitched. The designer sells the digital file for photo mug on Etsy, so that is as close as I can get to "His Eye Is on the Sparrow" until I finish a few WIPs...maybe next year(LOL). Anyway, I love your project choices; I must check out Dutch Beauty...had never seen that before. Have a great stitchy weekend. Thank you! I love Always in My Heart - I've had it in my stash for awhile now. It's so pretty. Hi Nicole, I enjoyed watching your video! I'm the same - I frame very few pieces of my stitching. If you came into my home, you probably wouldn't guess that I'm a stitcher. Unless it's Christmas - I have quite a few stitched ornaments on my tree! I do have framed pieces from the early 90s (OMG I'm sounding OLD!) but styles change and these would look out of place now. Perhaps I should get them re-framed? Cindy here. I rarely frame what I've stitched. My finished pile goes back almost 40 years. It's the cost of framing that stops me, but I do finish smalls, stand-ups, ornaments, etc. Have had Dutch Beauty in my charts stash for years! You go for it! I love His Eye is on the Sparrow. I think I might need that one. American Sampler is at the top of my list right now. I keep having to stop myself from purchasing until I finish a WIP. Your February Word Play is so pretty, love the colors!